We are Marc & Núria and welcome to Lo Cel de Toló where we provide sustainable rural accommodation that is respectful of nature in the Pallars Jussà, Catalonia. The Cel de Toló is 960 meters high, in the Montsec de Rúbies, and is surrounded by meadows, forests and mountains. 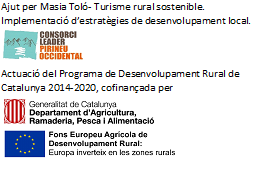 Do not miss this option of responsible tourism, in addition, you can enjoy various activities such as these!